As time has gone by it is no longer a rarity to see a pair of pricked ears or a fluffy straight tail in the street lights, but one more moment and the fox is gone. An unused eye often does not even notice such movements in the pressure of our own doings and thoughts. 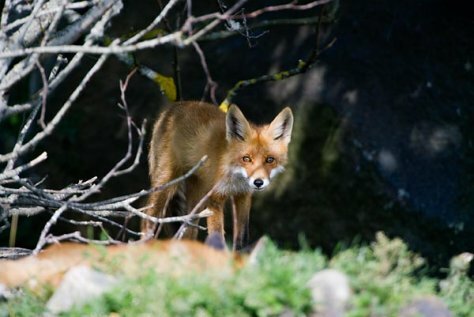 There are actually quite many urban foxes and not just at Nõmme and Kadriorg or the garden suburbs but also at Mustamägi, Lasnamägi, Õismägi ... our Brother Foxes are not particularly fussy about living environments. This spring too another generation of city animals since many generations back was born, and they have no ties to a forest life. The springtime male young foxes have already had to find themselves a new territory and it will be in the city. There is a similar development in all urbanised areas in the world. We can easily imagine the menu of the foxes: they catch and kill small rodents which is all to the good, but other things come from garbage containers. No rabies cases have been noted although no vaccine has been spread from aircraft over cities. With growing numbers the risk of mange grows. It is caused by the sarcoptic mange mite (Sarcoptes scabiei) that can infect dogs and cats in cities and villages, in the wild raccoon dogs, wolves, lynxes. Foxes also carry some parasites dangerous to humans, one of them the fox tapeworm (Echinococcus multilocularis). (in Estonian, English summary on p 31. - NB: some photos of infected animals in appendixes may be unpleasant).